Left: Cylinder head for small engine. Rubber Plaster Molding (RPM) has been a staple at Armstrong RM since the business was founded. It is a fast and affordable alternative to investment casting, sand casting and prototype die casting of non-ferrous alloys. But it has one constraint: foundry tooling. To accelerate the process, lower the upfront investment and increase design flexibility, Armstrong RM has put a new twist on a mature process. One-Shot Casting eliminates the need for foundry tooling. Plaster molds are poured directly from laser-sintered models, which are burned out of the mold after the plaster has set. This makes the process faster and less expensive for small orders of aluminum, zinc or magnesium castings. Al, Zn or Mg parts in 1 to 2 weeks. Ideal for 1 to 10 castings. No cost or added time for design modifications. Simulates die casting properties and appearance. Ever tried to persuade a foundry to cast a single piece in short order and at a reasonable cost without the promise of a big production order? With One-Shot Casting, Armstrong RM makes this a practical request for even the most complex non-ferrous castings. So, when you need a truly-functional prototype during product development, consider One-Shot Casting. When the near-net shape capabilities of One-Shot Casting are combined with Armstrong RM's secondary operations, you will have a part that rivals those from a production order. 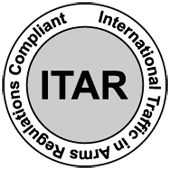 Castings made by this fast-track process will perform much like a production part because of its great metallurgical properties. 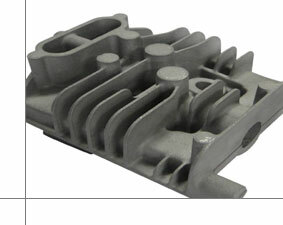 As shown in the material specs, One-Shot Casting delivers properties that simulate those of production die casting. For larger orders or additional alloys, also consider other processes available from Armstrong RM: Rubber Plaster Molding, Precision Airset Sand Casting and Graphite Die Casting. For detailed specifications, view a technical data sheet for One-Shot Casting. 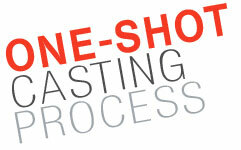 For a One-Shot Casting process description, view the following information.